Kitsune – LEAVE A COMMENT AND BE IN TO WIN A RARE GACHA ITEM! ♔ LoTd #153 – LEAVE A COMMENT AND BE IN TO WIN A RARE GACHA ITEM! Hey my Gacha Lover’s! It has been a couple of weeks, I have been so busy with family and I am also getting ready to go out of town for a much needed vacation! I wanted to share with you photo I worked on with Some Enchantment and Shiny Shabby Event goodies. 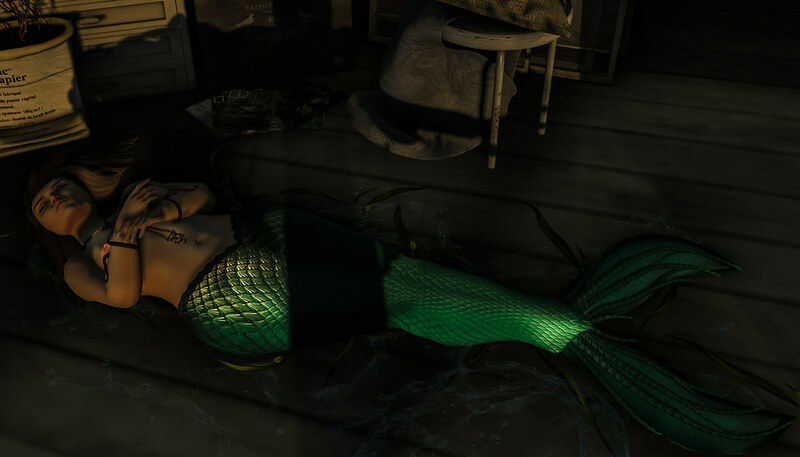 The Enchantment Event closes on September 4th at midnight SLT and they have THE most amazing Mermaid Themed items I think you should check out, if you have not already. In addition, The Shiny Shabby Event is still open with its August goodies and will be open until September 14th, so definitely check out the Gacha items there as well as the great fashion and decor finds. With all of this Gacha Garden Event excitement, I know you are a little busy organizing and playing with your new Gacha’s! There is a really great event that I want to let you in on. I have been attending Enchantment for quite some time now and it is the event to go to if you are into anything mystical! Their theme for this round is ‘The Little Mermaid’! I have been a lover of The Little Mermaid, in its Disney and original story form since I was a little girl. If you want anything ‘mermaid’ themed, I suggest you check this event out. Enchantment starts August 14th and I assure you, you will NOT have any disappointment on what their Creator’s have to offer.